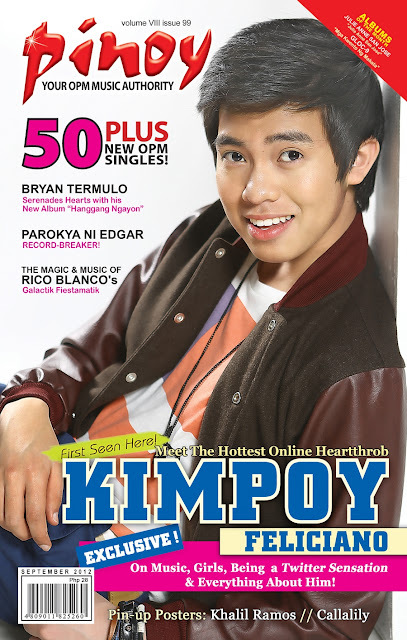 Online Heartthrob Kimpoy Feliciano graces the cover of Pinoy Magazine September 2012 issue. PINOY MAGAZINE is a 100% pure OPM song magazine that features today's best, hottest and up-coming artists. On its 99th issue, Kimpoy Feliciano, one of the country's Peace Ambassador is in the cover. ONLINE HEARTTHROB Kimpoy Feliciano grateful for blessings coming his way! Online Heartthrob Kimpoy Feliciano attributes all the breakthrough opportunities coming his way to the love of his Twitter, Tumblr, and Facebook friends. He was recently named by Malacanang as one of the country’s Peace Ambassadors. Kimpoy went home for 12 days to finish a slew of projects prepared for him, which includes his debut album under Universal Records, pictorials, music video shoots, interviews, TV guestings, among others. He guested in toprating programs like Party Pilipinas, Toda Max, Cge TV, Bubble Gang, Manny Many Prizes, MYX Daily Top 10, Star MYX and was featured in news programs of ABS-CBN, TV5 and GMA. His album under Universal Records boasts of an interesting concept that will surely entertain his followers. He considers his meet-up with followers as one of the highlights of his trip, where he spent an afternoon with some of his supporters. Keep on visiting Pinoy Magazine on Facebook at (http://www.facebook/PinoyMagazine) or follow them on Twitter: (@pinoysongmag) for more updates about the said issue. Also grab your own copy now!